Making puppets can be a really fun activity for children. Using a few readily available materials, kids can create characters to retell many of their favorite stories. You can use puppets to help kids express their feelings, too. 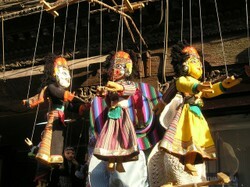 Find out how to make many different types of puppets on this page. All of these are great starters for making a hand puppet. Something to make hair -- yarn, carded wool, cotton balls, feathers, fake fur, etc. Position the cardboard inside the sock near the toe. Add some eyes and hair. Use your marker to add a nose or other details. Don't forget a silly voice! The mitten can be used much like a sock, but if you are using a glove, cut off the fingers (and use them later for finger puppets) and sew the top up. Add the eyes, nose, and hair in the same way as above. Deciding on the personality of your puppets is part of the fun and will determine the type of eyes, nose, and hair you will add. Stick puppets are quick and easy to make with even very young children. All you need is a picture of a person or an animal and a popsicle stick. You can even use a drawing the child has made herself. Cut the picture out and glue or tape it to the popsicle stick. Using the stick, you can move the stick puppet around to tell your story. This is fun to do from under the kitchen table, but you can peek the puppet up over a book or a pillow, if you'd rather. Since shadow puppets are seen as shadows on a screen, you can use fairly simple materials to make them. Shadow puppets aren't looked at directly by the audience, but their outlines as shadows are. You will want exaggerated features that will look real as shadows. These you can make by cutting out cardboard shapes or even practicing using only your hands. If you decide to use cardboard, try cutting out the arms and legs in sections and attach them back together by poking holes and tying together with string. Then attach wires to the backs and practice making them walk, etc., until you can make the movements smooth. Your hands will be able to make life-like movements even more easily. Practice with easy animals first, such as rabbits. Then play with your hands until you can add dogs and birds to your repertoire. This can be a lot of fun! You will need a screen or just a sheet draped across the room with a desk lamp behind. Your puppet will move between the screen and the light so that all that is seen by the audience is the shadow. You can make the puppet larger or smaller by adjusting the distance of the light. But Beware the Advertisement at the End! What Type of Puppet Is Your Favorite? If you can make a puppet or doll's head and dress him or her in a loose outfit, you can make it into a marionette by attaching strings to the head, the hands, the knees and the feet. Tie the strings to two dowels that you cross in the middle: the head is attached to the middle where the dowels cross over and the ends of the dowels attach to the hand and knee strings, right side to right side and left side to left. Experiment to see what works best for you, but I think the front dowels should be attached to the knees while the back ones should be attached to the hands. Try it out yourself and see what works best for you. By holding the crossed dowels, you should be able to manoeuvre the puppet well with a little practice. A marionette brings lifelike movements to the puppet theatre stage. Marionettes, or string puppets, charm the audience with the magic of story. Find finger puppets of all kinds on this page! Find some great animal finger puppets and some stories and songs to go with them. Source for some interesting rod puppets! Darcie and Nick, thanks for your comments. There are so many types of puppets to make! Sock puppets and finger puppets are my favourites. So easy to make.